Map showing the extent of the Patagonian Ice Sheet in the Strait of Magellan area during the last glacial period. Selected modern settlements are shown with yellow dots. The sea-level was much lower than shown in this picture. During the last ice age the Patagonian Ice Sheet created the elongated and forested drumlins seen south of Puerto Williams, Chile. The ice sheet extended beyond the crest of the Andes into Argentina, but because of the dryness of the climate it did not reach beyond present-day lakes such as the Yagagtoo, Musters, and Colhue Huapi. 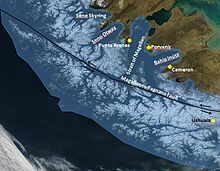 At its peak (about 18,000-17,500 years ago), the Patagonian Ice Sheet covered about 480,000 km² of land with an estimated ice-volume of more than 500,000 km³, of which about 4% remains glaciated today in two separated portions known as the Northern and Southern Patagonian Ice Fields. The ice-volume reduction contributed to a global sea-level rise of about 1.2 meters. However, during the first glacial period at the beginning of the Pleistocene ice extended to the present-day Argentine coast. With each successive glaciation it is known that the ice has stopped further and further to the west, with aridity always serving as the decisive factor halting glacier spread: it is believed that the east-west precipitation gradients during glacial periods were even steeper than the extremely steep ones of present-day Patagonia. Unlike the Laurentide Ice Sheet or the ice sheets of Northern Europe, the Patagonian Ice Sheet did not cause major extinctions or loss of biodiversity. This is because the flora remaining to the north of the ice were isolated by the Atacama Desert and were able to speciate easily wherever suitable microclimates occurred. In fact, most of the original Antarctic flora survives today on land occupied by the ice sheet. However, there are indications that during the last deglaciation (17,500 years ago), the rapid melting of the northernmost extension of the Patagonian Ice Sheet resulted in a dramatic release of freshwater to the adjacent ocean, decreasing its salinity and altering its circulation, resulting in significant ecological changes both locally and remotely. This page was last edited on 9 July 2017, at 07:19 (UTC).